The EUR/USD got a double punch from the worse than expected 2019 Italian budget - at 2.4% of GDP and the disappointing low September eurozone core inflation reading (0.9%YoY vs 1.1% expected). On the former, while the Italian budget deficit shows the challenging attitude of the Italian government towards the EU, it's not overly dramatic as the deficit proposal remains below the 3% threshold. Our rates strategists expect the 10-year BTP-Bund spread to stabilise in the 250-300bp area, yet not necessarily break above the 300bp level (as the rating agency, Moody is looking likely to downgrade Italy in October) - we don't expect to see a repeat of the scale of the BTP sell-off this May. Hence, the latest Italian situation and its implications for the euro shouldn't be overly detrimental. Rather, the EUR/USD price action next week may be driven by US data. Here, our economists note a downside risk stemming from the potential for distortions related to hurricane Florence. The likely softer figures should put a soft floor under the EUR/USD. The key data points to watch are US September ISM Manufacturing, non-manufacturing and the labour market report due Monday, Wednesday and Friday respectively. For the non-farm payrolls, we look for below-consensus (160K vs consensus 188K) and average hourly earnings at 2.8%YoY. It would be difficult not to conclude that further yen weakness would be on the cards when seeing USD/JPY reach a fresh 2018 high this week. However, we would chalk much of the yen's depreciation down to transitory factors such as quarter-end flows, dollar funding needs and an unwind of safe-haven bets. Indeed, it's difficult to make a negative fundamental JPY case when we looking at the recent slew of Japanese data (uptick in Tokyo CPI, solid retail sales) and the Bank of Japan stealthily taking steps to taper and normalise policy ahead of the crucial October rate meeting. The 3Q Tankan survey will be quite important at the start of the week, due Monday - while we'll also get the August wage data on Friday. We look for limited risks for USD/JPY to sustainably move above the 114 level in the near-term. GBP: A hat-trick of negative Tory party conferences? The key event risk for sterling is this weekend’s Tory party conference – a pivotal one, to say the least, for prime minister Theresa May, who speaks on Wednesday. While we remain constructive on the big picture outlook for GBP/USD – and see 1.40 at the turn of the year – it’s difficult to ignore the potential downside risks stemming from UK politics in the week ahead. Indeed, GBP has traded with a negative bias in and around the last two Tory party conferences; on average GBP/USD has fallen around 1.0% after PM May’s prior conference speeches. We wouldn’t be surprised to see a hat-trick of GBP sell-offs if the prime minister has another difficult conference. GBP/USD holding 1.2980/85 (50-dma area) in the coming week would be crucial. On the UK data front, we've got September PMIs and August Bank of England monetary data due on Monday, where it'll be interesting to see any changes in foreign holdings of UK gilts after a pretty sizable decline last month (albeit largely due to redemptions). For now, negative Brexit sentiment is the primary driver for the GBP assets, however, if this was to turn positive, then we think GBP/USD could be set-up for a bullish recovery based on constructive fundamentals - a steeper UK rate curve (BoE tightening), solid UK economic activity (relative to bearish expectations) and a structurally weaker USD. The debate at the October Reserve Bank of Australia meeting on Tuesday will centre around how officials balance solid domestic activity and ongoing external risks. Since the last meeting, we've seen 2Q Australian GDP surprise to the upside - while employment growth bounced back after a summer lull. But the escalation in the US-China trade war and ongoing global trade uncertainties remains a headwind to the Australian economy. On the Australian dollar, we expect the RBA to retain the same neutral tone - noting that it has depreciated against the US dollar, but the trade-weighted index remains within ranges. None of this is likely to jolt benign market expectations over an RBA rate hike; the AUD OIS curve is pricing in a 25bp rate hike around 4Q19, and this seems about right given the balance of risks. In terms of Australian data, the focus next week will be on August retail sales due Friday, August trade data due Thursday and September PMI readings on Tuesday and Thursday. Beyond this, we expect the high-beta AUD to remain particularly sensitive to ebbs and flows in global risk sentiment. Look for AUD/USD to remain supported above 0.7140/50 for now. The September Reserve Bank of New Zealand meeting yielded very few surprises - with the central bank retaining the key forward guidance phrase of the next OCR policy move 'could be up or down'. Coupled with mixed business confidence data, this has seen the front-end of the NZD OIS curve retain a dovish skew - investors are still marginally betting on a near-term rate cut (~~10% probability of this priced in for Feb-2019). When it comes to the business confidence data, while we saw the ANZ survey rebound from its lowest since 2008, a domestic farmer confidence survey turned negative - suggesting it is still too early to call for a turn in the New Zealand business climate. There's very little going on in the domestic calendar in the week ahead, but the biweekly GDT dairy auction due Tuesday may be of some relevance as dairy prices have slumped 14% since June 2018 and we'll be looking to see if there's any stabilisation in line with what's occurring in other sectors within the commodity complex. Look for NZD/USD to remain supported above the 0.6600 level in the absence of any fresh bullish USD momentum. The future of NAFTA will likely dominate the Canadian dollar price action over the coming weeks - despite Bank of Canada Governor Stephen Poloz effectively giving the green light for an October rate hike (82% priced in). It's almost certain that we won't get a trilateral trade agreement between the US, Mexico and Canada by this weekend's deadline, however, the fact that President Trump may find it difficult to terminate trade deals through Congress formally means that we could be stuck with a 'Zombie NAFTA'. It's difficult to say with any conviction how this limbo impacts the real Canadian economy - and for now, we can only assume that it's business as usual. In this state of NAFTA-limbo, there is a particular emphasis on Canadian data to keep the CAD afloat. The September jobs report due Friday will need to show signs of a rebound after a disappointing release last month - while slowing wage growth (latest 2.9% YoY) will also need to show signs of stabilising. Other data to note include September PMI due Monday and August trade data due Friday. Look for USD/CAD to trade around 1.30 in the absence of any major NAFTA sentiment shift in either direction. Messy European politics - both Italy budget risks and Brexit noise at the Tory party conference - will likely keep the Swiss franc, a European haven, bid over the coming week. While we did see EUR/CHF move above 1.14 on a trade war haven unwind, the pair fell sharply below 1.13 on the back of the budget-related Italian asset sell-off on Friday. It's difficult not to see further Italian budget noise here weighing on EUR/CHF - especially ahead of potential downgrades by rating agencies and budget clashes with the European Commission in October. The risks, however, is that we could see the Swiss national bank intervening on any sharp moves below the 1.12-1.13 level. On the Swiss franc side, the key data point to note next week is September CPI due Friday, where consensus expects +0.2% MoM increase (+1.1% YoY). 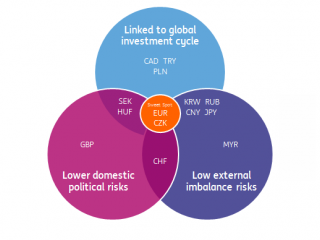 Although Swiss data rarely tends to have much of a sustained impact on the currency, especially during times when the focus for FX markets is on European politics. We see the downside to EUR/SEK as very limited from here as all the risk premium has been all but priced out of SEK and the market is now fully pricing in the 25bp hike by 1Q19, which is now our base case as per New Riksbank call. On the risk premium front, given the likely protracted negotiations on the formation of the new government with early elections next early year being a possibility, we see limited scope for SEK to move much higher vs its short-term fair value. The mix of the persistent rise in oil prices (brent firmly settling above 70$/bbl) and stabilising risk environment has been pushing the Norwegian krone higher, with EUR/NOK decisively breaking below the 9.50 level. These two factors are now more important for NOK price action than the Norges Bank stance whereby the market already fully adjusted its expectations following the dovish hike earlier in the month (with two hikes priced in for 2019, in line with the central bank's latest guidance). On the domestic front, we should see a modest decline in September Manufacturing PMI due Monday, but the reading should remain more comfortably in the expansionary territory vs. the one in Sweden. This suggests some modest upside to NOK/SEK in the early part of the week, with the cross-testing the NOK/SEK 1.0900 level. The next key level for EUR/NOK to watch is the horizontal support of 9.4000.